Many Touring Riders feel they don't need hi-performance suspension. The mistake is the belief that it is just for racing. 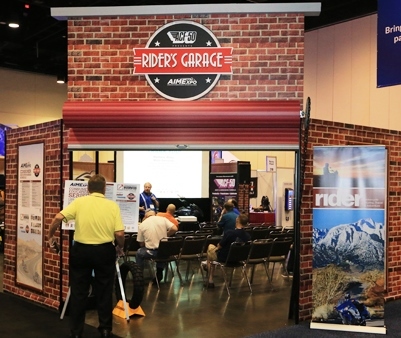 Touring Riders have different needs: Comfort, safety and of course better handling. Properly setup suspension offers major benefits to the touring motorcycle. Two-up riding puts an even greater demand on suspension often making the passenger suffer needlessly. Sport Touring bikes are known for mushy suspension, although fine in some situation; too many times control is sacrificed. Race Tech can smooth out the jarring bumps allowing you to ride more miles daily with greater comfort. This also results in less wear on your body and makes for happy pillion riders too! The real trick is improving firmness, while creating plushness and improving control at the same time. This, along with increased traction and a consistent feel and feedback keeps you in control in almost any situation: blitzing across a two lane roads, pushing the limits on a mountain road, or just cruising down the interstate. If you want the best possible comfort, control, and handling, you are in the right place. Touring bikes are notoriously under-sprung causing the bike to feel lazy and heavy (yes, the bikes ARE heavy). Proper spring rates improve ground clearance as well. Want a custom color on a rear spring? ►Powder Coating is available! The Gold Valve equipped fork is the ultimate front end providing a firm yet plush feel that doesn't dive excessively. Race Tech's Gold Valve Fork Kits are designed to do just that. Gold Valves and Gold Valve Cartridge Emulators eliminate the limitations of the stock valving setup. Gold Valves use an improved piston design to give outstanding performance, feel, and tuneability. ►What is a Gold Valve and what does it do? Race Tech's award winning Gold Valve Kits for Shocks provide great performance without the cost of a replacement shock. Gold Valve Shock Conversion Kits are installed in the stock shock. They provide a personalized setup, creating a plush feel with improved bottoming resistance and more control at the same time. The Kits include Gold Valve, Valving Charts and Shims to allow a custom setup for a specific rider and conditions. These Kits can be installed by individuals interested in understanding and tuning their own suspension (if you have the proper equipment & experiance with suspenion service) or they can be installed by a Race Tech Center or the Service Department at Race Tech. The ultimate rear suspension solution; Race Tech's G3-S Custom Series Shocks are custom built replacement shocks. These shocks have been tested in all types of conditions to provide the best performance. On many models G3-S Shocks add external damping adjustability. Engineered to be ultra-durable and tested to provide a plush feel with improved bottoming resistance; these shocks are state-of-the-art. "My ride home from Lake George/Americade was smooth and exhilarating. Feeling the power of the Gold Wing as I took the corners through the Catskills left me with quite an envious smile on my face. As I have explained numerous times this week to other riders, I finally found the rest of my horsepower through the set up of the Race Tech suspension. While I know that nothing is different with the engine, the suspension has allowed a very positive transference of torque to the tires; thus propelling it forward with a very smooth and aggressive thrust of power. I am a believer!!!!!!! Thanks, Reno Britt"
Race Tech Suspension for the GL1800 is tested, proven, and guaranteed to provide an amazing ride. The stock suspension is under-sprung with the weight of the bike consuming 66% of the suspension travel on the 2006-2010 models. This creates a heavy, lazy feel and results in low ground clearance. Check out this video of a Gold Wing rider riding over 4x4 planks demonstrating the control riders gain with Race Tech Suspension. 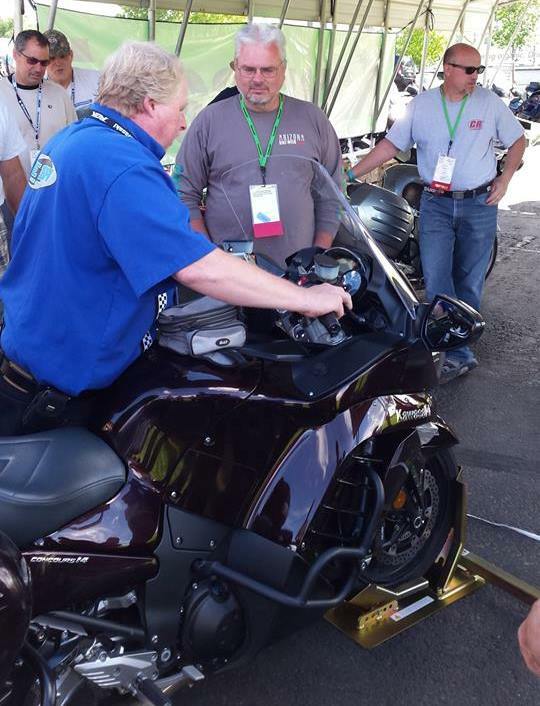 This video is from the Lee Parks Total Control Suspension demonstration at Americade. RT Hi-Performance Springs with the proper rates are a must for both front and rear. The additional travel from a proper spring rate provides more controlled braking and drastically reduces ground clearance issues. Find your recommended spring rate. The stock GL1800 forks have a cartridge in one side and a damping rod in the other. The Gold Valve Fork Kit offered for this model uses Compression and Rebound Gold Valves on the cartridge side that allow a custom setup. On the damping rod side, a Gold Valve Emulator is used. Combined with RT Hi-Performance Springs, the GL1800 Gold Valve Fork Kit produces a smooth ride with excellent dive control and improved bottoming resistance. Race Tech offers two options to improve your GL1800's rear suspension. The first option improves the stock shock's performance by installing a Gold Valve Conversion Kit along with a proper rate RT Hi-Performance Spring. This is the most cost effective option and includes a Gold Valve to create a plush feel over bumps, with increased bottoming resistance, and a personalized setup. The GL1800 Shock Conversion also includes our Hydraulic Preload Adjuster Upgrade, replacing the line on the stock Preload Adjuster. We have found it is common for the stock line to expand causing the adjuster to become ineffective. The replacement increases response of the adjuster and improves the consistency of your ride and preload adjustment. CORE CHARGE - We have stock shocks at Race Tech. To save down-time we can revalve, respring and do the Hydraulic Preload Adjuster Upgrade to one of these shocks and send it to you before you take your shock off your bike. We will charge you a core charge of $100 until we receive your stock shock. 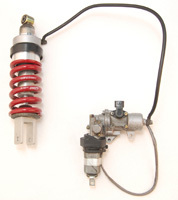 The second option is a complete G3-S Custom Series Shock. These shocks include an external Rebound Adjuster and come with Gold Valve and Hi-Performance Spring; valved and sprung specifically for the rider. Every G3-S Shock is 100% Guaranteed to improve the performance of your motorcycle's suspension. Hydraulic Preload Adjuster Upgrade is available for the GL1800 G3-S Custom Shock for $94.98. We have found it is common for the stock line to expand causing the adjuster to become mushy. This upgrade replaces the rubber hose on the stock Preload Adjuster with a braided stainless steel hose. This upgrade includes oil and labor and dramatically improves adjuster response. CORE CHARGE - Since we need to rebuild your stock electric hydraulic preload adjuster we keep rebuilt adjusters in stock. To eliminate additional down-time we offer an exchange program for your shock. We temporarily charge a fully-refundable "core charge" of $100 until we receive your stock shock. We check your adjuster to make sure it is operating correctly and then refund your core charge. TNK Fork Tubes are OEM quality replacements for Touring motorcycles. They are the highest quality and generally significantly less expensive than the original equipment. These tubes are made from the best materials and are available with color options. The Venture suffers from being soft and spongy as a result of the fork springs being too soft. RT Hi-Performance Springs with the proper rate will decrease excessive dive under braking and increase travel. Find your recommended spring rate. Race Tech offers a Gold Valve Emulator Kit transforming the stock damping rod type forks in the Venture to perform like well-tuned cartridge forks. This award winning technology removes restrictive orifice style damping and a mushy feel with progressive, velocity sensitive damping; resulting in increased traction, bottoming resistance, and control. The second option is a complete G3-S Custom Shocks. This adjustable shock features Rebound Adjuster and come with Gold Valve and Hi-Performance Spring; valved and sprung personalized to the rider. Available for both Dual Shock and Mono Side Shock applications. Every G3-S Shock is 100% Guaranteed to improve the performance of your motorcycle's suspension. Honda Valkyrie Touring model suffer from very harsh factory setup, Race Tech Suspension Upgrades will provide a smooth, comfortable ride. Installing a Gold Valve Fork Kit along with RT Hi-Performance Springs at the proper rate is the first option to improving handling on the Valkyrie. Compression and Rebound Gold Valve Kit eliminate flaws in the stock piston and valving design; providing a plush, controlled feel and eliminating chatter over bumps. Bottoming resistance is drastically improved as well. Handling, comfort, and control will be increased - GUARANTEED! Off the showroom floor, the Kawasaki Voyager 1700 suffers from a mushy yet harsh feel because it is under-sprung and has too much high speed compression damping. The Air Shocks require constant attention and still under perform. Race Tech can drastically improve the lazy feel of your motorcycle and deliver a firm yet plush feel with great bottoming resistance. The Voyager suffers from feeling heavy and mushy as a result of the fork springs being too soft. RT Hi-Performance Springs with the proper rate can drastically improve your ride. Find your recommended spring rate. Race Tech's Gold Valve Emulator Kit for the Voyager adds an award-winning Emulator to the stock damping rod type forks. Emulators transform the forks to perform like well-tuned cartridge forks and replace a mushy feel with progressive, velocity sensitive damping; resulting in increased traction, bottoming resistance, and control. The Voyager is very under-sprung and over-damped in stock form. Race Tech can drastically improve the mushy feel of your Voyager and deliver a firm yet plush feel with great bottoming resistance with out need for added air pressure. We have these options for ZN1300 Voyager Six Cylinder Model as well! As with most touring bikes, the Yamaha Venture comes under-sprung and over-damped in stock form. Race Tech can drastically improve the mushy feel of your motorcycle and deliver a firm yet plush feel with great bottoming resistance with out need for added air pressure. We have Fork Options for Early Venture 1200/1300 as well! Check out these links to Race Tech Magazine Project Bikes and Product Evaluations! Upcoming Product Review in Rider Magazine Race Tech G3-S Custom Twin Shocks on BMW R75/6. Watch for it coing soon! 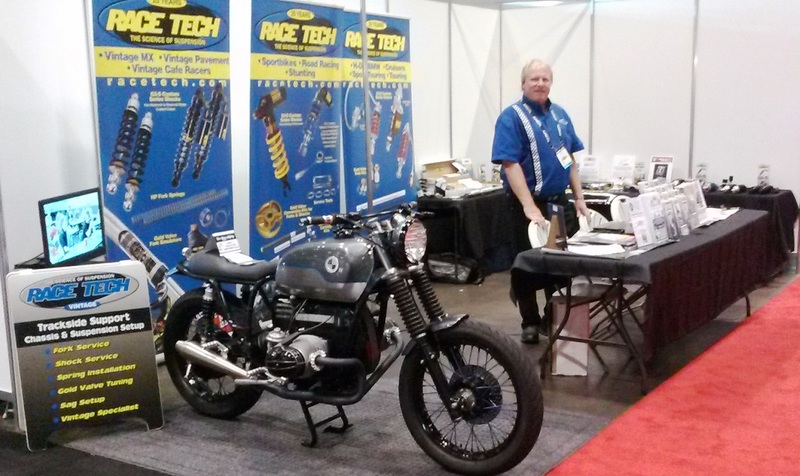 Race Tech supports Street &Touring Enthusiasts as well as Racers. Today's age of high-horsepower superbikes, large-displacement cruisers and super-heavy-weight touring bikes, riding skills are more important than ever for safe, fun motorcycling. Unfortunately for experienced riders, there is a large gap between the Motorcycle Safety Foundation's Experienced Rider Course (ERC) and the many racetrack schools around the country. Many riders are interested in improving their skills but are unwilling to take on the additional risks associated with a high-speed environment. If you fit into the "I'm interested, but" group, you're not alone. In fact, if you add up all the attendees of all the race schools together, they only represent a tiny percentage of street riders. This is not to say they are not good schools. To the contrary, they have much to offer. But they are not for everyone. Fortunately, Lee Parks' Total Control Advanced Riding Clinic (Total Control ARC) has a solution for those experienced riders "caught in the middle," as well as those track-day junkies and racers who want to be able to further enhance their skills in a controlled environment with expert instruction. ►Read More! Send your suspension into Race Tech Service Department for upgrades and rebuild work. 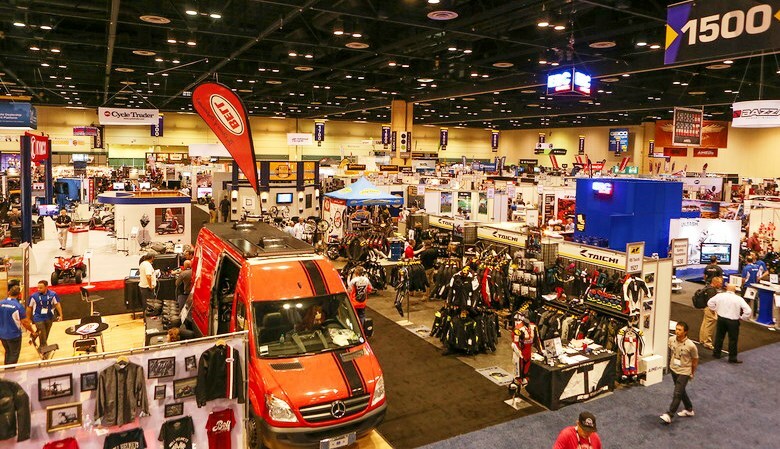 Race Tech is at many events to answer your questions and assist with your suspension needs. If your bike is not listed in our Product Search, you have questions about applications please Email Matthew Wiley forTech Support/R&D. Matt can also be reached at 909-273-4985 during regular business hours MST Monday - Friday. Matt can also be reached at 951-279-6655 ask for Matt or 909.273.4985 during regular business hours PST Monday - Friday.